These guides, which are frequently updated, are intended to provide the best practices and a guide to getting starting in a particular area of ministry. See the complete list here. Interpreting at Church: A Paradigm for Sign Language Interpreters, 4th edition (Leo Yates). Goodreads information. Available for Kindle Readers or in paperback from Amazon or paperback from B&N. Deaf Ministry: Ministry Models for Expanding the Kingdom of God, 2nd edition (Leo Yates). Goodreads information, UM Disability Blog review, Stories by Hand review. Available for Kindle Reader or paperback from Amazon. Pocket Reference of Religious Signs, revised (Leo Yates jr). Paperback from Amazon and others. Religious Signing: A Comprehensive Guide for All Faiths revised (Elaine Costello). Goodreads information, publisher's site. Available for Kindle Reader or paperback from Amazon and others. Hymns for Signing, Abingdon Press. Goodreads information. Available from Cokesbury. So you want to be an interpreter? (Janice Humphrey). Paperback or CD from Amazon and others. “Religion Signs”, a 5:32 video from YouTube. “Signing with Val - Religious Vocabulary” a 10:59 video from YouTube. Resources for religious interpreting website. “See it! Say it! 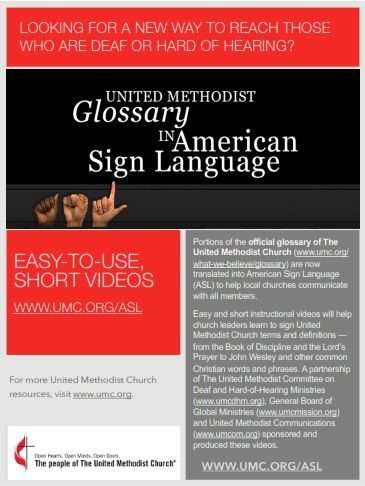 Sign it!” a video about ASL in worship from the Minnesota Conference.